The Subaru Telescope captured this image of exoplanet GJ 504 b, which is several times larger than Jupiter. A gas planet about four times the size of Jupiter may be giant, but it's one of the smallest alien planets ever captured on camera, according to a new study. 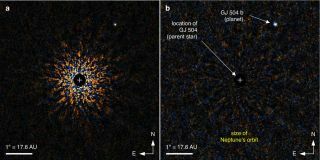 The planet's relatively small size and far distance from its star, called GJ 504, marked a milestone for Japan's Subaru Telescope, which took the discovery images in 2011, according to Adam Burrows, a co-author of the study. With the Kepler space telescope sidelined by gyroscope problems, Earth-bound telescopes are taking the lead to conduct fresh observations of potential planetary systems. Planned upgrades to two other telescopes will make it easier to spot these planets from the ground, Burrows said. GJ 504 b is a cold planet roughly estimated at four times the size of Jupiter. It's far outside the reach of its young, sunlike star's habitable zone, or the area where liquid water is possible. Other factors, such as the thickness of a planet's atmosphere, can fudge the habitable-zone metrics. Nonetheless, this planet's orbit is far away: At 44 Earth-sun distances, it's farther, on average, than Pluto is from the sun in Earth's solar system. At a very rough estimate of 160 million years old, the system is relatively young. (Earth's system is 4.5 billion years old). GJ 504 b is not as young as previous planets caught on camera, however, which were in the range of 50 million years old and younger. At 460 degrees Fahrenheit (238 degrees Celsius), the planet is colder and bluer than others imaged, astronomers say. The planet's discovery came during a larger survey. It was found as part of the Strategic Exploration of Exoplanets and Disks with Subaru (SEEDS) program, which looks at star systems of many sizes and ages to figure out how planetary systems come together. SEEDS is in its third year of a planned five-year observing run, in which it will examine 500 stars. The early results of this study show great promise, Burrows said. "This was one of the discoveries, and there will be others," he said. Although photos of big exoplanets excite astronomers, a picture of an Earth-size planet is what will really interest the public, Burrows said. Current technology isn't quite ready to capture such a photo, but astronomers continue to improve the contrast of stars and planets where they can. The Gemini Planet Imager, for example, is expected to be installed on the Gemini South telescope in Chile later this year, with dedicated science operations starting no later than 2014. Using this instrument, exoplanet hunters plan to survey 600 stars in the first two years of observations. In 2014, Chile's Very Large Telescope is expected to get a planet-searching upgrade known as SPHERE (Spectro-Polarimetric High-contrast Exoplanet Research). The primary science goal of the instrument is to image giant exoplanets around nearby stars, particularly planets that are more massive than Jupiter, in various stages of evolution. "They will bring us another order of magnitude or two [of improvement]," Burrows said, adding that these instruments aren't quite advanced enough to pick out an Earth-size planet. Pictures of smaller and smaller planets, however, are coming all the time. "It's very possible that, in the next decade or two, we'll have the capability to actually see these things directly and separate their light," Burrows said. The study on GJ 504 b has been accepted for publication in The Astrophysical Journal. Several countries took part in the study, which was led by the University of Tokyo. Follow Elizabeth Howell @howellspace, or SPACE.com @Spacedotcom, Facebook and Google+. Original article on SPACE.com.